The XF5F Skyrocket is a premium rank III American fighter with a battle rating of 3.0 (AB) and 2.7 (RB/SB). It was introduced in Update 1.37. The XF5F Skyrocket is an oddity. Its lightweight coupled with the underwhelming armament aren't what you'd expect from a twin-engine fighter, but so is its manoeuverability. 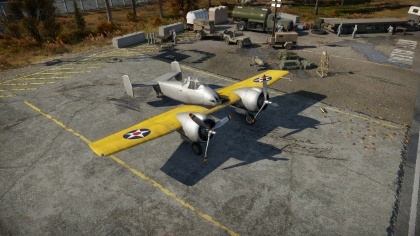 Indeed, it is among the most agile twin engine plane out there, coupled with the low weight and its two power plants, makes for a unique flying style. The Skyrocket's primary role is going to be Boom and Zoom ; the climb is pretty good, and so is the energy retention if you stay under 550 kph and opt for smooth, moderate turns. However, the lack of heavy armament means that you will have to keep your guns on target longer in order to achieve consistent damage. Such opportunity comes when the enemy is low on speed and unsuspecting; for example at the top of a loop, or in a sustained turn fight with an ally plane. Be cautious as you go past 600 kph however, as it locks up, similar to the XP-50's high speed compression. Overall, the XF5F is a plane that favors high alt, medium speed engagements, where it is safe from crashing in the ground and has room to maneuver. If need be, you can push the XF5F into a more aggressive energy fighter, similar to the Bf 109's, where looping back on the enemy while holding superior speed and altitude allows to extinguish the energy little by little. The responsive roll and pull, coupled to the effective combat flaps and engine throttle management and acceleration, allows for some nifty dogfight against heavier planes that believe to hold an easy prey. Keep in mind however that the engine will overheat badly at low altitude and even more so at around 2,800m due to the supercharger setting in. Temperature isn't nearly as critical at higher altitude (around 12K ft) where fresh air will cool your motor apparatus quickly. Alternatively, you may manually set the radiators to ~40% water/20% oil for continuous 100% engine power. Exploiting the opponent's weakness while relying on a fast straight-line acceleration for escapes out of an unfavorable situation. Especially energy fighters (Bf 109/C.205/La-5) trying to out turn a twin-engine plane can be lured into stall-speed turn fights and intercepted during their subsequent speed recovery. Single engagements at low altitude are optimal thanks to fast acceleration trumping dive speed and climb. Engagements with multiple opponents are to be avoided, since the XF5F needs a substantially longer time to effectively engage and eliminate a target. In Realistic Battle and Simulator Battle, the stiff opposition, in form of Bf 109 G-2s, Fw 190As, Yak-9Ts, Yak-3, and La-5FN will give you a serious run for your money. Always make sure you hold the energy advantage at all time and pick your fights with care. 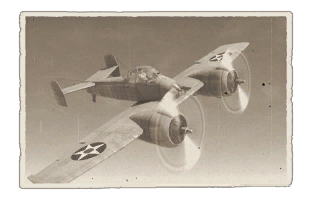 Countering an XF5F could include out-diving or -stalling with horizontal maneuvers followed up by a steep ascend; exploiting its weak energy retention and sluggishness at low speeds. Another tactic is to force the XF5F into a head on attack. Since it's not very well armed, chances are it will lose, unless it manages to accurately snipe from a distance or dodges the head-on. As a gift plane, all modules are researched from the get-go. In the January 2014 event "Winter Magic", the XF5F was given to those who participated the most in the event. In 31 October 2014, the XF5F was one of the few planes that could be received by Gaijin in their 2nd anniversary present giveaways.